The first biography to focus exclusively on Angus Young – from his remarkable rise from working-class Glasgow and Sydney to the biggest stages in the world. If you're looking for a deep look into the life of rock's foremost schoolboy, you won't find it here. The biographical elements for Angus's pre-AC/DC life are fairly solid, but once the band kicks off, the text is very much focused on the performer. The offstage man is repeatedly described as 'private', and author Jess Apter seems little inclined to impinge on that desire for privacy. What you do get though is a solid and very readable account of AC/DC the band, and Angus Young's central contribution to their success. I doubt there is much here to surprise a dedicated fan, but if you've only a more passing awareness of the band, then there are plenty of interesting tales. Really enjoyable history of the band and the surprising truth about the mostly teetotalling Angus. Music and musicians from my generation. Easy read. Really informative book about one of the true rock icons of our time. A character who is totally unlike your typical rock musician. 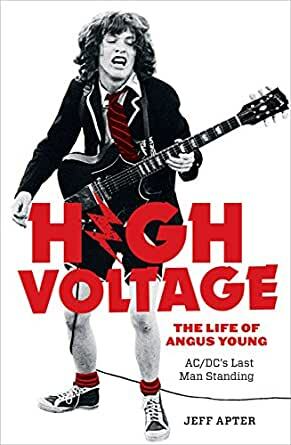 5.0 out of 5 starsHigh Voltage: The life of Angus Young. Jeff Apter. Lots of new information. Loved it. Very informative. Easy reading. Very easy to read. Greatest guitarist and band the world. Learnt a lot about the very early days and the last tours with Axel.